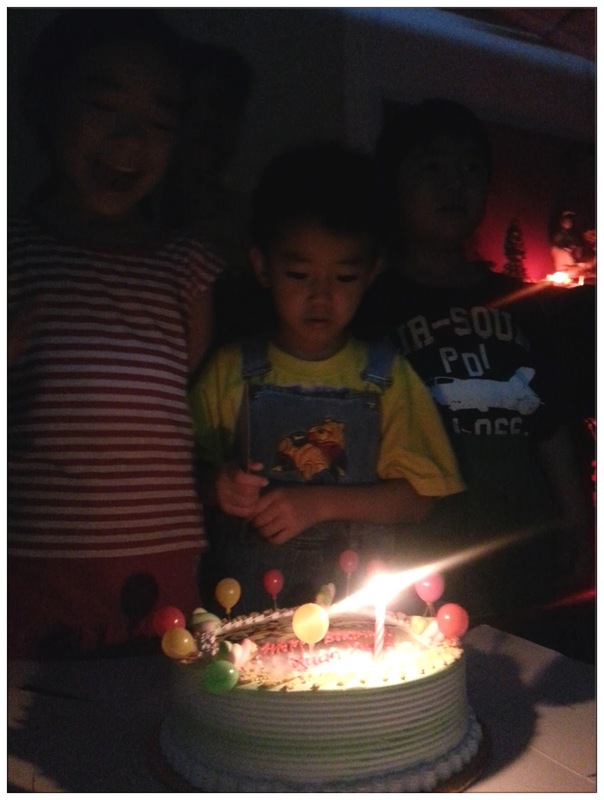 31st of August, Xuan Xuan's birthday, and this year marked his 5th year on earth. 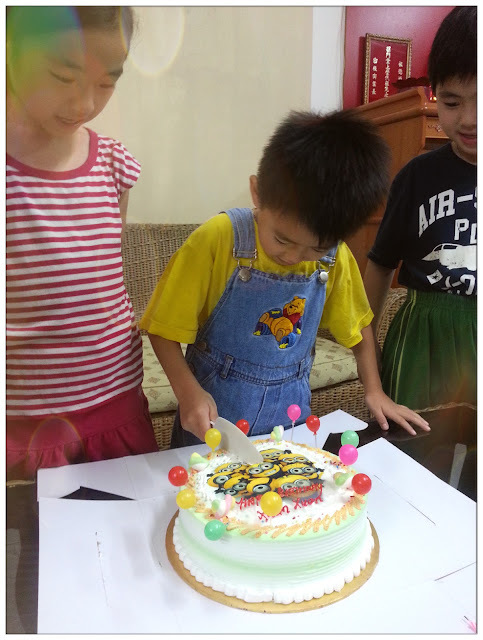 As usual, I will go to Ipoh and celebrate his birthday with all the relatives and Xuan's cousin sisters and brothers, the more the merrier, right? And this year, the theme is Minions. 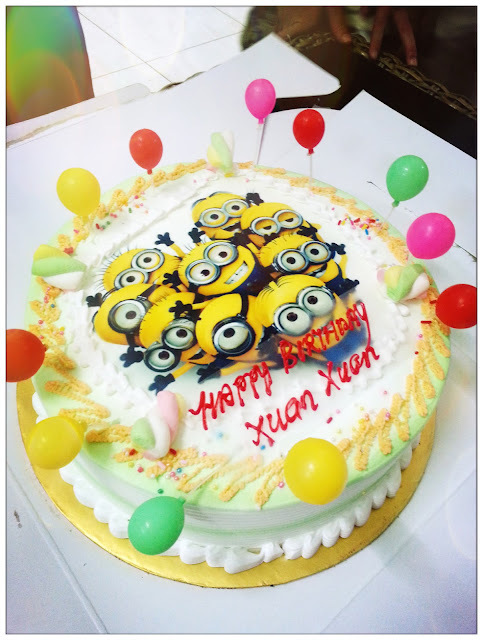 Can't believe how updated Xuan Xuan is, he plays Minions Rush, Subway Surfer, watch Running Man, knows more bout stuff that's in trend than I do. Sometimes I do think I'm the one who lives inside a cave and knows nothing that's popular nowadays. 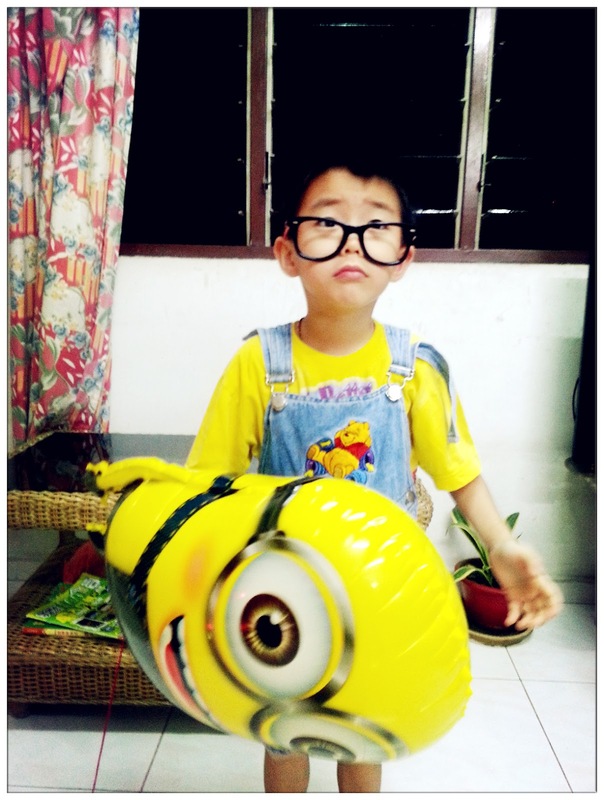 So since he wants everything to be minions-themed, so I might as well dress him up as a minion too, even though he doesn't want it and I have to force him to get out from the room after I dressed him up hahahaha. Poor thing. This is his unwilling face and unwilling to pose for me to take photos. 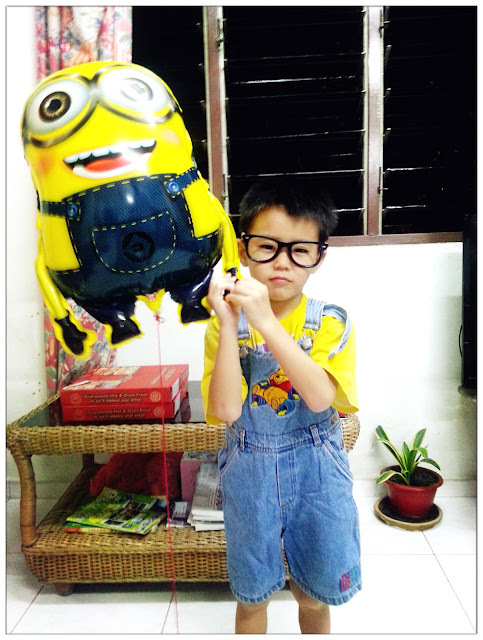 Minions balloon are bought by Xuan's aunt. The cake's picture was preordered because have to custom-made the sugar icing photo of minions. I was walking round and round inside the cake shop wondering what flavour of the cake should I choose. Chocolate cake was out of my list because I tried it the day before and it wasn't good, so I was having a hard time deciding between Black Forest and some other flavours, but in the end I chose black forest because the mixture of chocolate and berries, should be nice and suits both adult and children taste isn't? 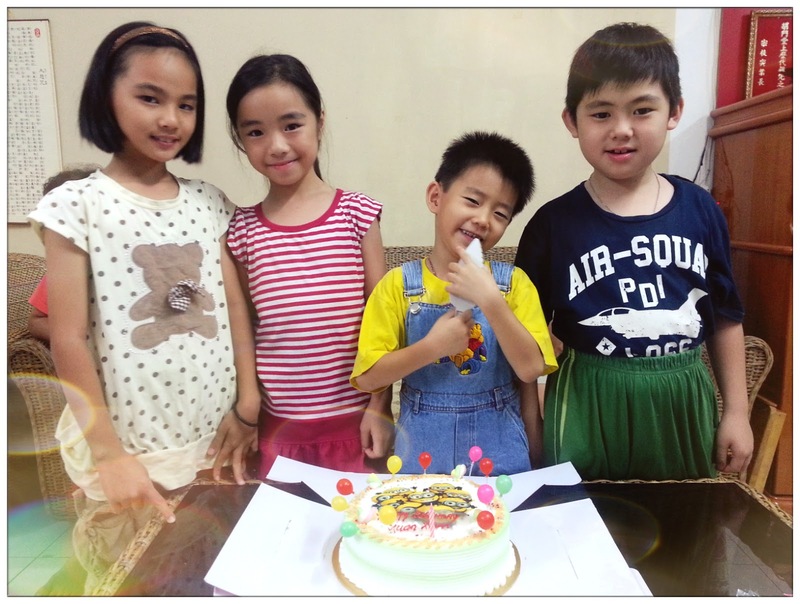 So colourful and nice-looking birthday cake for a 5 years old! Gotta thanks the cake shop for being so thoughtful! 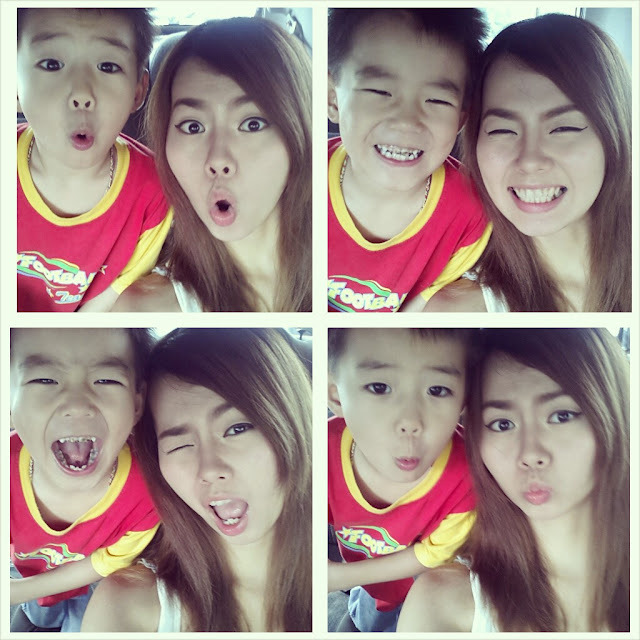 With all Xuan's cousin sis and bro. 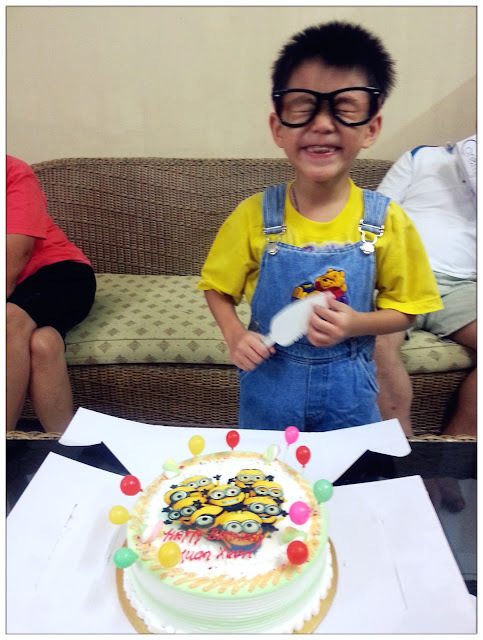 How time flies, he's so big boy now can cut his birthday cake all by himself already. 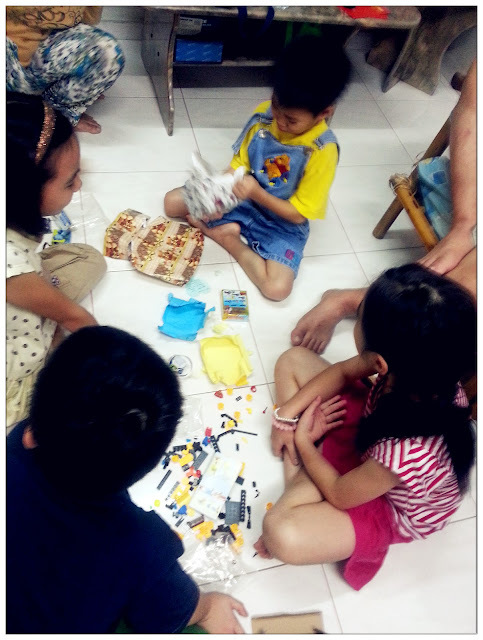 Loved by his cousin sis and bro, they all actually gave him presents individually! Forgot to take photo with the birthday boy that day, but we had fun and the cake was delicious! I'm glad he enjoyed his birthday weekend and it was a fun-filled holiday. As I've said, how time flies and he's 5 years old now, there's nothing I wish for him than to be happy and stay healthy all the time. Hahaha he's a super 吃货 I tell ya, he ate all the delicious food only! Can't wait to see him during Mid-Autumn Festival! Counting down the days of seeing him again. As for those who love to know where to buy the cake, here's the details of the shop, although I think it's not located at Lapangan Siber but near to the main road outiside Aeon Station 18.